Guests of Kingston Plantation Condos have a total of nine pools to choose from. Little ones will have a blast at Splash Waterpark. The multi-million dollar fitness center has everything you need to get your cardio on. Grab the popcorn and gather the kids on the couch for movie night. 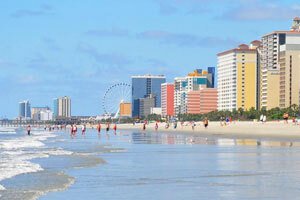 The resort is located directly on beautiful Myrtle Beach. Little ones will love the children's playground, waterpark, and last river. Enjoy a relaxing float down the lazy river at the resort's waterpark. Kids will have a blast at the waterpark, featuring waterslides, a water playground and a lazy river. The resort has two indoor pools, perfect for days when the weather isn't cooperating. Thanks to the poolside bar, you're only seconds away from a refreshing cocktail. Kingston Plantation Condos is located on one-hundred and forty-five acres in the heart of Myrtle Beach. The resort is in a gated community that is shared with Embassy Suites Myrtle Beach and Hilton Myrtle Beach Resort, known as the Kingston Plantation Resort Complex. The complex has twenty-four hour security providing your family peace of mind. I hope you packed your sunblock because you will have your pick of nine indoor and outdoor pools to choose from. Enjoy a relaxing swim or order a refreshing cocktail from the poolside bar and catch up on your celebrity gossip in the latest issue of People magazine. Little ones will love having access to Splash Waterpark. It’s a fifty-thousand square-foot water park with a lazy river, water slides, and jet sprays. Up for even more fun? Head over to The Landing Myrtle Beach Spa and Fitness Center. Get your cardio on using the exercise equipment, take a Zumba class or take advantage of the tennis courts. The Landing features an indoor pool and a splash pad area for the kids. Treat yourself to a massage, facial or body treatment at the full-service spa. Individually owned and decorated one- to four-bedroom condos sleep four to ten guests. Take the family along on a field trip to Kroger, just a short drive from the resort; your full kitchen won’t stock itself. Make sure to pick up all of the ingredients for your famous snickerdoodles. Back at the resort, let the little ones assist with baking a batch (or two). Don’t worry when the kids inevitably end up covered in cinnamon and sugar; you'll have an in-suite washer/dryer. Take a night off from cooking dinner and order room service. While you wait, catch a show on the flat screen TV with premium channels HBO, CNN, and ESPN. After dinner, have the family change into their pajamas while you grab the DVDs you packed from home. Have everyone meet in the living room, pop some popcorn and gather on the couch. Ask for a show of hands to decide which movie to watch first on the DVD player. Daily housekeeping is included with your stay, so that’s one less thing to worry about. Break up your party into two groups: the golfers and the shoppers. Kingston Plantation Condos is a short drive to Arcadian Shores Golf Club. This par-72 course was designed by Rees Jones and opened in 1974. It has recently undergone a renovation and now has a new clubhouse. There’s no shortage of shopping options available in Myrtle Beach. Tanger Outlets Myrtle Beach on Highway 17 has American Eagle, Calvin Klein, Coach, Kate Spade and Lululemon. Barefoot Landing is home to Barefoot General Store, where you can find Myrtle Beach souvenirs. Get in touch with your inner elf at Christmas Mouse. Check out the apparel and accessories at Del Sol; they change colors when they are exposed to sunlight. Hungry? Visit Johnny Rockets, Joe’s Crab Shack or House of Blues. Go for a ride on the SkyWheel. It’s almost two-hundred feet tall and has enough room for everyone in the family to ride together.